In sitting down to plan out features for patch 1.0.8, we decided as a team that we really wanted to improve multiplayer co-op. We have other more long-term improvements planned as well (like the itemization updates Travis discussed earlier), but we knew there would be a lot of immediate benefit if we could just make it easier and more rewarding for people to play with each other. 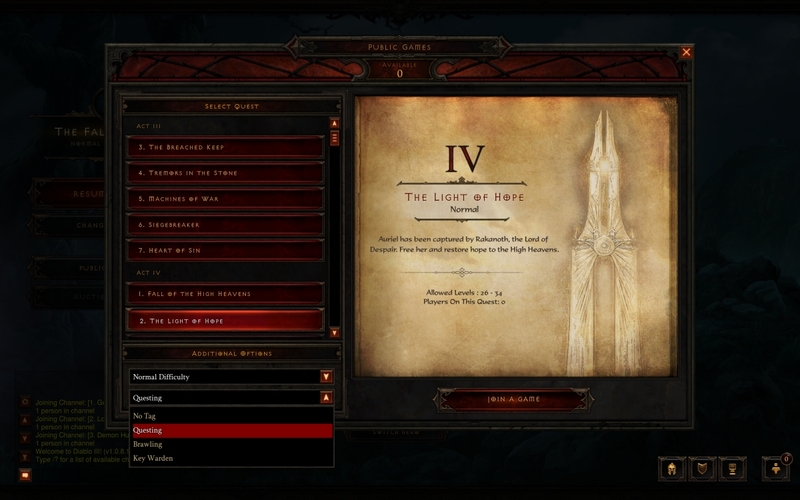 From day one, it’s been our goal to make Diablo III a great co-op experience, but right now it's not living up to its full potential. Even if you enjoy playing with your friends, it can often feel easier and more efficient to play solo. Playing solo has a number of advantages. For instance, you can choose your own route. If you're farming for something in particular (like a specific recipe), you can do it as many times as you want. And you can pause the game and attend to things in real life without making anyone wait. Of course, multiplayer is awesome, too, and comes with its own benefits. 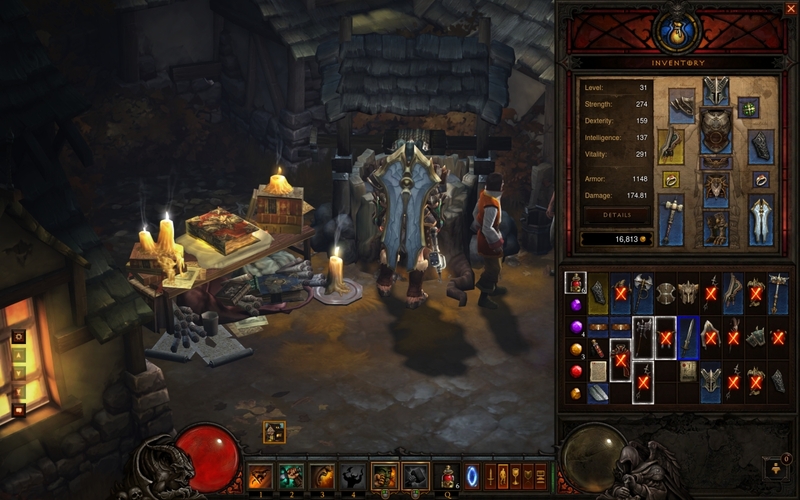 For example, leveling up characters with a group of friends can be an amazing experience. Working together with other players to take down bosses or destroy Elite packs super quickly makes for great farming runs. There's resurrections and the banner system, and don't forget farming for Infernal Machine keys and organs. But, there are also disadvantages, like having to coordinate where you're walking and what you're attacking, losing your followers, and trying to find groups that have similar goals to yours without a defined matchmaking system in place. The point is that multiplayer can be lot of fun, but given the downsides it can often feel not worth the effort. By making it easier for players to find one another, improving social features, and providing direct buffs to co-op groups, we hope to change that perspective. Patch 1.0.8 introduces the ability to specify what we call a "matchmaking tag" for Public Games. The way this new system will work is pretty simple: in addition to selecting a difficulty, quest, and MP level, you can also select a tag that will identify what kind of gameplay you're looking for from a Public Game. 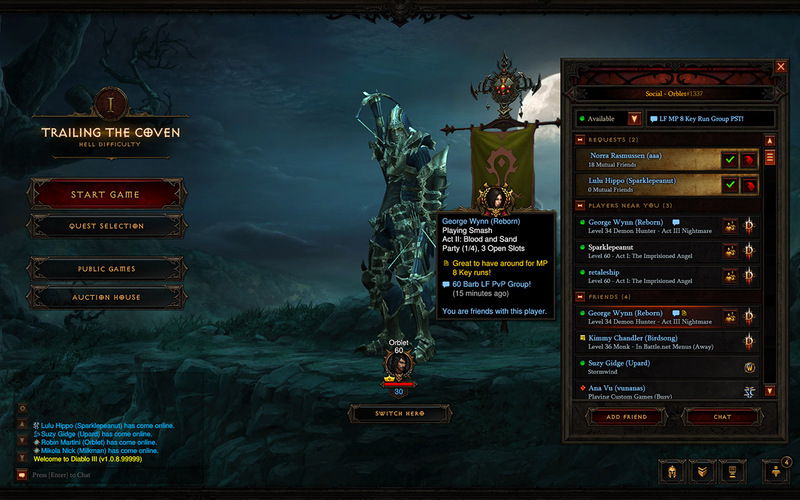 The tags going onto PTR are Questing, Full Act Clear, Keywarden, and PvP. Selecting one will tell the matchmaking server to place you in a group with other players who have selected the same tag as you. The goal is make it easier for players to find groups that fit their personal play style or will yield the best experience during any given play session. We'll be evaluating these tags during PTR, so if you have suggestions for other tags please don’t hesitate to let us know! Many players have already figured out that if you coordinate well with your party, you're more efficient. That's definitely true, but we'd like this benefit to be more explicit. So, we're going to straight up add a bonus for playing in multiplayer. We're still working on the details of what that buff is going to be, but at the moment we're looking at 10% more XP per extra player in the game for a maximum bonus of 30% more XP in a 4-player game. This bonus will be multiplicative with MP bonuses. For example: suppose you are playing on MP10 with an XP bonus in Inferno of 510%. This means a monster is worth 610% of its normal XP (510% more). If you are playing in a 4-player game the monster will be worth 793% as much XP as normal. 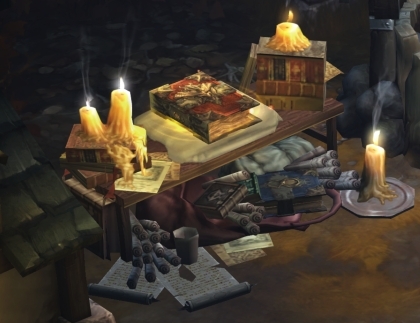 On top of this, you will also earn a flat 10% Gold Find and 10% Magic Find for each additional player in the game, and this bonus can exceed the 300% Gold Find and Magic Find caps. Monsters currently gain 70% extra health per additional player in the game. This is being reduced from 70% to 50%. This means in a two-player game, monsters have 150% as much health as a single-player game. In a three-player game, they have 200% as much health. And in a four-player game, they have 250% as much health (compared to 310% on live). This further compensates for some of the inefficiencies that come with playing in a group. Ideally, this will allow you to play with someone who is less geared than you and still be better off than playing solo. It also means if someone strays from the group temporarily in a 4-player game (which inevitably happens from time to time), you'll still be at a greater advantage than if you were playing on your own. As previously mentioned, 1.0.8 adds Identify All to the game. In addition to being a huge quality of life improvement, ID All is good for co-op play too! We found during our playtests that a common time for players to get separated from one another is when somebody's inventory was full and they spent a non-trivial amount of time in town identifying items, so this should help keep players together. When you're playing co-op, one common practice is to say "e" in chat when you come across an Elite pack. So we thought—why doesn't the game just do this for you? 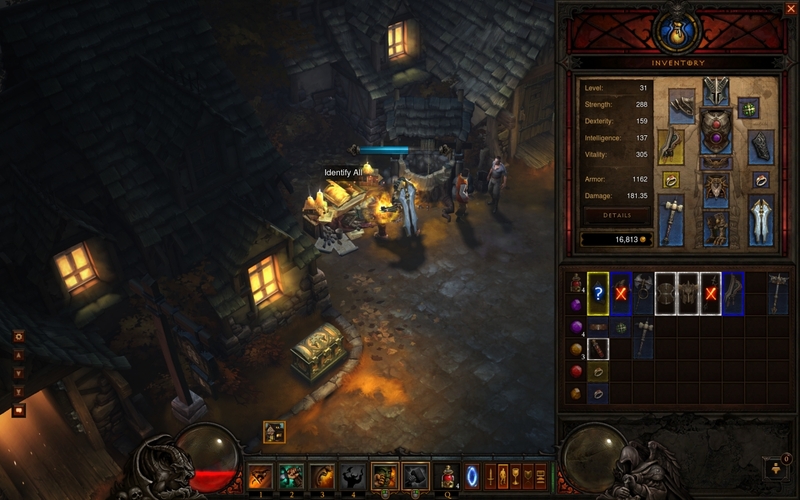 Starting in 1.0.8, when a player deals damage to or takes damage from an Elite pack or Treasure Goblin for the first time, a notification will be sent out to the entire party to let your teammates know what you've found. This will be accompanied by a "combat" icon on the mini-map so other players in your group can locate those enemies. On top of that, we're also going to put a combat icon over your banner in town. This way, players who are in town will know that you're fighting an Elite pack or Treasure Goblin and be able to quickly determine whose banner to take to get right into the action. Similar to the feature in StarCraft II, the "Players Near You" window will display all players who are logged into Diablo III from your local network. This feature is great if you're playing while at a university dorm or frequent Internet cafes, and will help you easily connect with other local players. 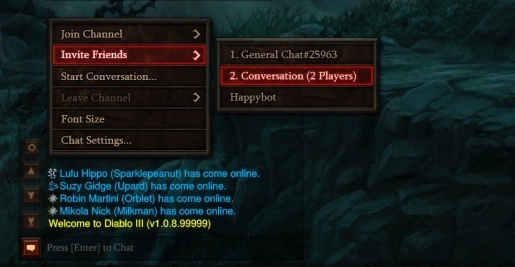 We're also adding private conversations in 1.0.8, which will allow you to chat with up to 99 of your closest friends. 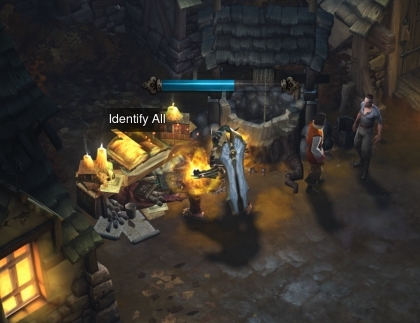 Think of private conversations in Diablo III as being similar to multi-user conversations in your favorite IM client. You're not making a permanent "channel," you're simply inviting multiple people to chat for the duration of that session. 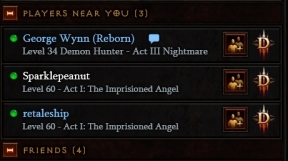 This is really just the first step in the process of improving the social experience in Diablo III and supporting its vibrant community. We know that players want bigger and more varied group chat functionality (like guilds and chat channels that are more permanent), and we do have concrete plans for additional features in the future. In the meantime, we hope private chat is a useful tool and look forward to delivering more systems that foster player interaction. This is just a snapshot of the improvements coming in 1.0.8, and you'll be able to test out these changes and more before they go live by hopping onto the PTR. We definitely encourage you to participate, test out what's new, and let us know what you think! 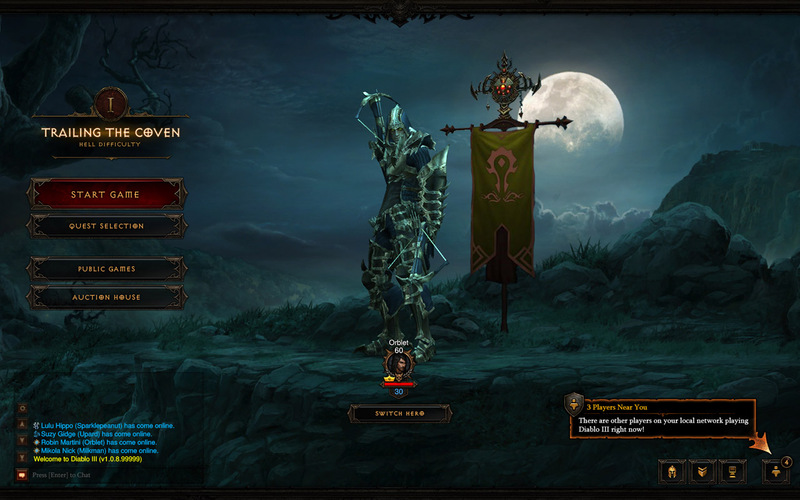 Wyatt Cheng is a senior technical game designer for Diablo III. He is currently toying with molecular gastronomy recipes. For science!